Over 80 million people visit YouTube each day. If your business has the budget and the need to leave a global impact upon the minds of millions of audience then advertising on YouTube homepage via Masthead banners is the best option. 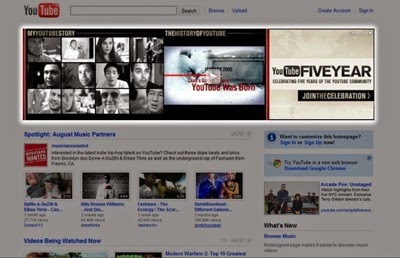 YouTube provides you the option to advertise on its homepage through custom mastheads for a full 24 hours. YouTube receives over 80 million unique global users a day so that's a massive exposure for your brand. The Masthead Unit ads comes with standard and expandable options. You can apply your full creativity on the canvas to display your brand message. Interactive rich media and social media links provide a great channel for tremendous user engagement. 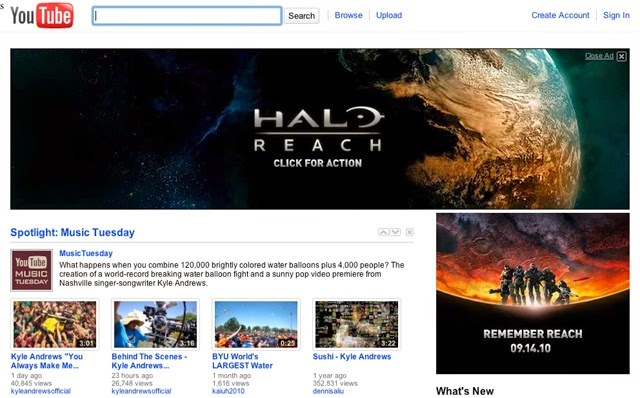 Masthead Standard: a 970x250 pixel in-page unit running the full width of the YouTube homepage. Masthead Lite: a 265x150 video thumbnail plus a 495x150 banner ad, that creates a 760x150 ad unit. Both are available as expandable ad units. Take a deep breath and relax! Its a whopping over $400,000 per day. If your brand can afford that budget then you have the power to reach almost half of the world's population through YouTube. You need to first sign up for an account with Adwords, then visit this URL. The YouTube customer service experts will let you know about the additional details. You will need to talk with YouTube advertisement executives in order to run your ad on the homepage. After all, it costs big money, isn't it?